Colorado is split into east and west slopes by the Continental Divide, which is the boundary between drainages that lead to the Pacific Ocean and drainages that lead to the Atlantic. The resulting division is often considered to be cultural and economic as well as geographic. The Front Range is Colorado's easternmost mountain range, which runs north-south from Milner Pass on the Larimer/Grand County line to Pikes Peak in the south. 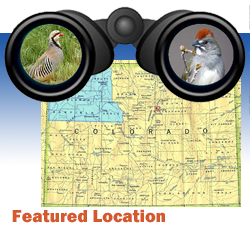 By extension, the term is also used to refer to the urban corridor which covers the adjacent plains from Fort Collins south to Pueblo. Three million of Colorado's four million people live along the Front Range. The Front Range foothill valleys are sometimes referred to as the Colorado Piedmont. In Colorado, the term "park" is used to describe wide high-elevation intermountain valleys...hence the valleys of North, Middle and South Park and the towns of Estes Park and Winter Park. The general term "intermountain parks" or "mountain parks" is often used to refer not only to the places just mentioned but to all the high-elevation valleys, including the San Luis Valley (SLV) and the Gunnison Basin.